JNTU Hyderabad : A large number of engineering colleges lost out on affiliation for the academic year 2016-17. In a press note issued late on evening on Sunday, JNTU registrar N. Yadaiah said 158 engineering colleges were given affiliation. With this the number of seats available for B.Tech first year students will be 79,705 seats. 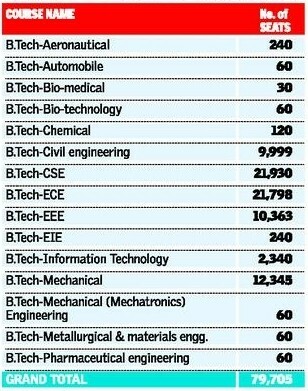 Engineering Colleges : The maximum seats are in Computer Science Engineering (21,930) followed by Electronics and Communications Engineering (21,798) seats. For the Academic year 2016-17, a total of 360 private colleges, including 241 engineering colleges, 89 pharmacy colleges, and 30 MBA standalone, have applied to JNTUH for affiliation. Among them 158 engineering colleges have been granted provisional affiliation with one or more branches with a total of 671 courses and 79,705 seats. Pharmacy colleges : A total of 46 pharmacy colleges were granted affiliation with 4,000 seats. This year 1.44 lakh students have qualified in the state of Telangana, Out of them 63,777 were made certification. They are eligible to fill the web options. Affiliation Notification for Osmania and Kakatiya Universities is going to be released on today, 04th July. In both the universities, there are 14 thousand seats available on aggregate and in which 10 thousand seats will be sanctioned by the Government. With this, there is a chance for overall 90 Thousand Engineering seats this year.